Posted by Ubi Dubium in Responses, Wow. 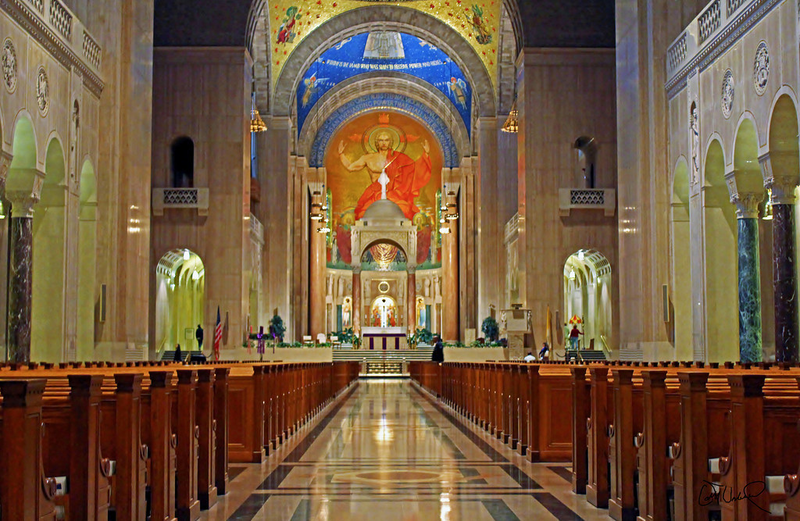 I spent part of this past weekend at an event at, get ready for it, the Basilica of the National Shrine of the Immaculate Conception. No expense has been spared in making this the most ostentatious show of piety possible. This is one of the largest churches in the world, built in a Byzantine style with small windows and lots of domes, and the interior is completely covered with expensive polished marble, and mosaics. And not just your average mosaics, either. For a lot of them, the background is done in clear glass backed by gold leaf, so that it glitters. The place full of nooks and chapels, each of which has some statue or icon or glittery mosaic, and the open spaces are likewise filled with statuary and memorials. (And places where you can pay to light candles. In the center of the basement is a big rack where they ask $4.00 to light one candle.) There are walls full of engraved names of the people who donated money to build this thing. 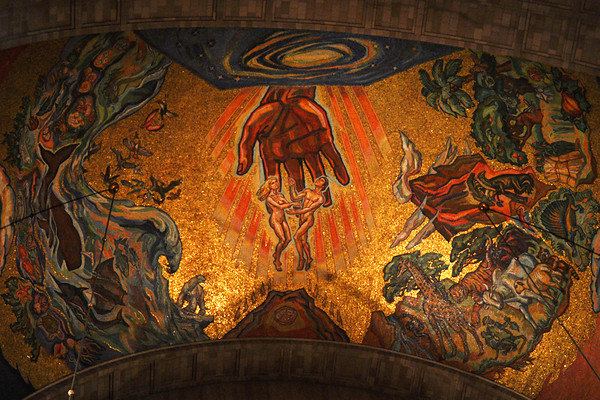 Now my general opinion of gods is that they are projections of the human ego, ourselves – just bigger and more powerful. That’s why they have wants and needs, and why their opinions line up so neatly with what their followers already think. Then we build big pointy temples to them to glorify our egos, often as if we’re compensating for something. The men (and I’m pretty sure it’s men in this case) who built this monstrosity certainly seem to have a lot to compensate for! The shrine [in northeast Washington DC] held special prayer sessions all day to honor the setting of the April Mass dates. It typically takes out the piece of bloodied cassock only after midday Mass as a holy relic Catholics can venerate, or pray before, as a personal item from someone close to God. 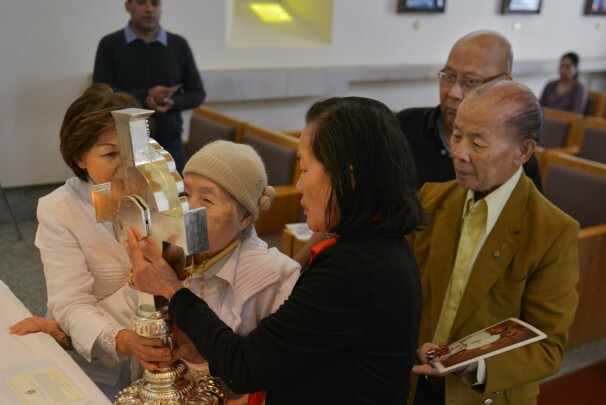 But the shrine kept it out most of Monday, encased in a silver cross-shaped vessel, so that people could come spontaneously to pray before it. This is 2014 almost, not the Dark Ages. These people are worshipping a frikkin reliquary!!! Please, human beings, grow up already! Posted by Ubi Dubium in Events, Humor, Rants. Well here it is “Good Friday”, the day that xians are supposed to spend moping around all day being so very very sad that Jesus had been killed. As a churchgoing kid, I never understood this idea or the name. If this sacrifice was supposed to be god’s plan for saving everybody, why were people acting so sad about it? And if everybody is so miserable, why is the name “Good Friday”? What’s so “good” about it? 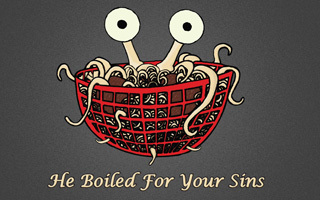 Well I’d just like to remind all you christians out there that for us Pastafarians, today is also our High Holiday. Yes, more important than Ramendan, a bigger deal than Pastover, more significant even than Talk Like a Pirate Day. Today is the highest of all Holidays, FRIDAY! Yes, Friday. Every single Friday. And you should celebrate it by goofing off, eating pasta, not giving up anything, and doing things you enjoy with the people you love. Services will be held at the Olive Garden, with an all-you-can-eat communion that beats the heck out of anything the Catholics are serving. You don’t even have to be Pastafarian to celebrate Friday. Just focus on living this one life that we know we have with kindness and love and passion, instead of focusing all your time and energy placating a god who might not be paying attention, or might not even exist. Posted by Ubi Dubium in Humor, Rants. Religious people often accuse atheists of being “closed-minded”, claiming that we wouldn’t believe in their god even if they showed us evidence. I’d be perfectly willing to reconsider my position on the subject, if any solid evidence were ever provided. The problem is that they have an entirely different standard of what evidence is, and how much evidence is enough. Their god-claim is an extraordinary claim, and as such requires extraordinary evidence to support it. Their usual routine of “Look at how complicated the world is, I have a holy book, and I feel it in my heart” just doesn’t fly with me. But there are things that I would consider as good evidence pointing to a god, if they ever happened. But they don’t. 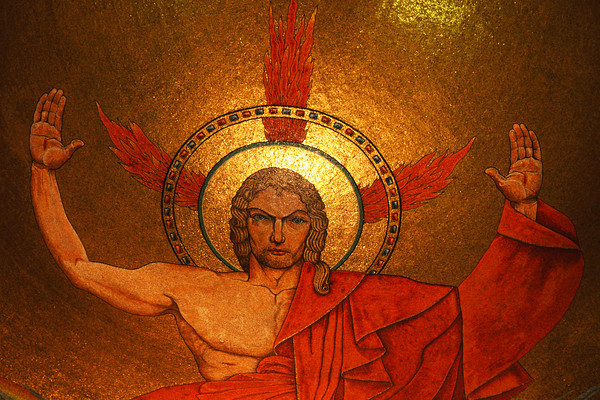 The recent conclave was a great opportunity for a god to give the whole world evidence that he actually existed. We had a bunch of powerful men running a corrupt institution, who were meeting to select a new leader who will protect and defend that institution from all outside threats. If there were no god, what we would expect is that these hard-liners will select a hard-liner from among their number who will continue running things just as they have always been. (Which is what always happens, and did again this time). But if these men actually had the kind of close link to a god that they claim they do, and if they were actually trying to listen to and obey the will of that god, then this would have been a great time for a god to produce an entirely unexpected result, and get the attention of the whole world. Scenario One: Cardinals emerge from conclave: “We’ve had a clear message from God that none of us is qualified to be Pope. We’re all too involved in scandals and we’re totaly corrupt. The next pope is to be chosen by popuar election, and present clergy are ineligible to run.” This woud get my attention. 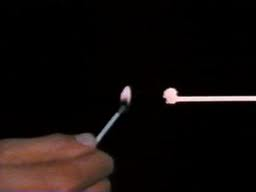 Scenario Two: Cardinals emerge from conclave: “God told us not to elect any more Popes. We’ve all been ordered by God to sell the Vatican, give all the money to the Red Cross and Planned Parenthood, disband the College of Cardinals, and then retire to a monastery.” This would really get my attention. I might start to think there actually wassomething to this god stuff if something like that happened. White smoke from the chimney (because if the Cardinals were actually guided by god, there would never be a need for any other kind). Cardinals emerge onto the balcony and one steps to the mike. So we took our ballots, and we each wrote down the name of a Cardinal, and the ink actually moved on the page to spell a different name. Every ballot! Cardinal Dolan here even filmed it on his cellphone, just to be sure. We’l post it on YouTube later today. So, a 76-year-old Argentinian homophobe who probably collaborated with a brutal military Junta is pope. yay. Good things – he’s not European. If the Vatican is ever going to adapt to the future, they’ve got to be willing to change things. So I guess this is a change. He prefers living simply and supporting the poor. Good there. Maybe he can sell off some of the Vatican’s enormous wealth and do something better with the money. I’m not holding my breath, but I’ll be pleased if it happens. Except, no they won’t. They’ll never appoint a true reformer, because they always pick one of their own. The vatican is a corrupt organization, answerable to no-one. The rich and powerful heads of this organization, who also answer to no-one, have gathered and selected one of their own number to be capo. This man will appoint the new cardinals, and the circle of corruption will go round and round. Maintenance of their hierarchy and power is always going to be put before the wellbeing of their “flock”. None of them are ever really held accountable to the catholic people who provide their power base. The only recourse that catholics actually have is to walk out of their churches and stop giving them money. If they vote with their purse-strings, the hierarchy will have to listen. But with a billion catholics in the world, it will take a lot of independent-minded catholics to make much of a difference, and we know how much the church encourages independent thought. In other news, apparenlty the Vatican recently bought Europe’s larget gay bathhouse! (http://www.independent.co.uk/news/world/europe/as-cardinals-gather-to-elect-pope-catholic-officials-break-into-a-sweat-over-news-that-priests-share-23m-building-with-huge-gay-sauna-8529670.html) The building apparenlty also houses 19 Vatican apartments, including the 12-room apartment of Cardinal Ivan Dias. What a convenient location! I wonder what other fun stories are going to crop up next. I’m waiting for the thing to come out that’s so bad that Ratzinger resigned to avoid dealing with it. Posted by Ubi Dubium in Humor, Responses, Uncategorized. 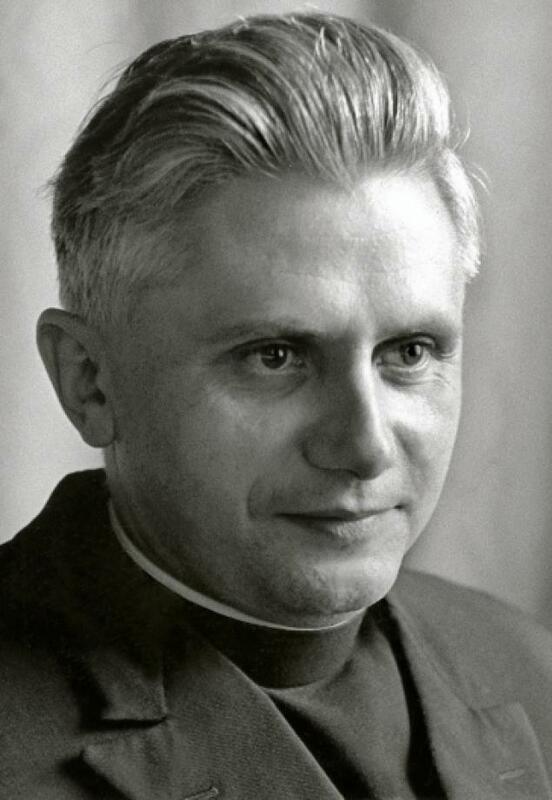 The man in the photo is Joseph Aloisius Ratzinger, once the head of a major international criminal syndicate. There are charges for conspiracy, racketeering and money laundering pending against him in several countries. Now retired, he has gone into hiding in a small principality within Italy that has no extradition treaties with any other country. Your mission, should you decide to accept it, is to get Ratzinger to voluntarily step outside the boundaries of this country , so that he can be arrested by the Italian authorities and extradited to stand trial. As always, if any of your team is caught, killed, or excommunicated, the Secretary will disavow any knowledge of your actions. 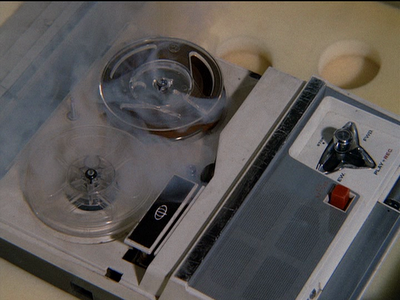 This tape will self-desctruct in ten seconds. Good luck Jim. Who does he think he is – Sarah Palin? Hey Joe, did you forget the job contract on this? You get to be “king” of the Vatican, live in unimaginable wealth and splendor, have enormous power, order around a billion catholics, and have people grovel at your feet all day. But the catch is that you have to do this until you die, no matter how sick you get. Seems a fair trade-off. If you can condemn millions of Africans to an agonizing death from AIDS by telling them not to use condoms, then you can just stay on the job from your sickbed! The last pope to step down was in 1415, and he did it to end a schism, not because he didn’t feel like being pope anymore. So what’s actually going on here? Can it be that the bad press has finally gotten too overwhelming? It’s becoming increasingly obvious that he knew about all the pedophilia and other abuses going on in the Catholic Empire, and has for a really long time. It’s apparent he was deeply complicit in the cover-up. As I saw on a comment this morning, he’s not the Sarah Palin of religion, he’s Richard Nixon. But what I think actually is going on is his last grab at power. Since a pope serves until he dies, the one thing he never gets to do is choose his own successor. Even if he were to let the cardinals know his preference for a successor, he’s gone by the time they choose. So there might be a chance that they would actually pick a decent person who was more concerned with the wellbeing of humans than in the power and public image of the catholic bureaucracy. (A small chance, but a chance). If Ratzo hangs around he gets an opportunity to push the cardinals to select another Sith Lord and keep the church securely on the Dark Side of the Force. 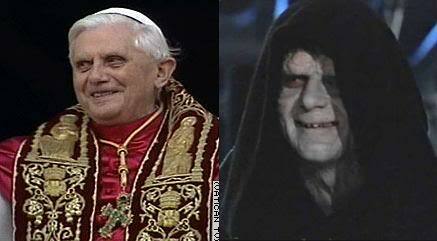 Will he be allowed to attend the conclave? I hope not, but there’s really no precedent for this, so this will be interesting to watch. Posted by Ubi Dubium in Questions, Rants. I’ve seen many blog entries posted about the shooting in Newtown, and most of the things I would say about it have already been well discussed by other bloggers. But the one thing that kept jumping out at me was that churches would hold “prayer vigils” for the victims and their families. This is probably a good opportunity for me to discuss my opinions on “prayer” in general. I see two things going on with prayer: first, what the believer thinks is happening, and secondly, what is actually happening in the real world. When an individual prays, they often say they are talking to god, or listening to god, or asking for god to do something, or trying to understand what god wants them to do, or connecting with the divine, or some such. I don’t think any communication with a god is actually occurring, but that does not mean that there is nothing beneficial happening for the individual. What I see actually happening is that the person is focusing their mind, tuning out outside distractions, and often concentrating on repetitive actions and thought patterns. In other words, meditation. I think meditation, in any form, can be helpful. In our hectic society, it’s great for a person to take a few minutes to still the clamor of everyday life. It’s kind of a reboot for the brain. If a person finds that meditating helps them function better, I’m all for it. As long as they are not pretending that they are causing changes in the world outside their own brain, or using it as a substitute for actually doing things. But what about vigils? When there is a tragedy, Christians often respond by holding this thing called a prayer vigil. They gather in groups for a long period of time, often overnight and usually outdoors. They light candles, sing songs, and spend lots of time talking to their invisible friend. From a real-world point of view, I get this. I really do. When a random tragedy strikes, we are shaken as individuals and need the reassurance that we are part of a supportive social group. Having a special gathering, and doing things together like singing and lighting candles can help us feel better. It’s the same reason I think we gather for funerals instead of grieving privately. Humans are social animals, and our response to major stressful events is to do group activities that reinforce the strength of our social support network. What I don’t understand is what believers think they are accomplishing with prayer vigils. Even when I was a believer, this seemed a totally pointless activity and I never participated when I could avoid it. If someone I loved had been killed or injured in some disaster or tragedy, and some church miles and miles away said they were going to help me by holding a prayer vigil, would this help me in any way? Certainly not! I’d tell them to get up off their knees and go do something real instead of the colossal waste of time and energy involved in a “vigil”. If they actually knew one of the people affected, contact them and, in addition to offering sympathy, ask if there is anything they could do to help them right now. Donate time and/or money to push for better care of the mentally ill. Donate time and/or money to push for better prevention of bullying in our schools. Prayer vigils don’t do any of this; as far as I can tell prayer vigils don’t actually do anything for anybody except those participating. And – how is it that you think holding a prayer vigil counts as helping??? So what are they trying to accomplish? From a blurb I was sent about this: “A gathering and vigil to ask the President and the nation to find strength and wisdom to steer us away from the Climate Cliff.” So they’re not actually asking god to fix the climate problem (which would seem to be the obvious answer if you believe in an omnipotent god who answers prayers), they are gathering to pressure the government into taking action. So why don’t they just call this what it is: a “protest”? Oh, no, this has to be a “vigil” because somehow that’s more effective than a protest. Sheesh.